The Powerstep Pinnacle Maxx, the next generation of foot orthotics, featuring Heel Secure Comfort System, a uniquely designed heel that offers a deeper cup and an expansive micro thin platform that is mildly angled for maximum support. The Powerstep Pinnacle Maxx Orthotics have been shown to reduce pain in the ankles, knees and lower back by providing medical grade motion control that prevents the heel from rolling inward and arch lowering (over-pronation). Powerstep Pinnacle Maxx is the orthotic of choice for motion control and stability shoes. The Pinnacle Maxx is also useful in relieving pain associated with on-the-job standing, walking, and high intensity sports involving running & walking. The prescription-like orthotic with the heel secure comfort system is sealed in two laters of foam with a durable EVA antimicrobial fabric (see diagram) for unsurpassed comfort & pain relief. 30-day money back guarantee for any reason. Podiatrist designed & APMA accepted to promote quality foot health. 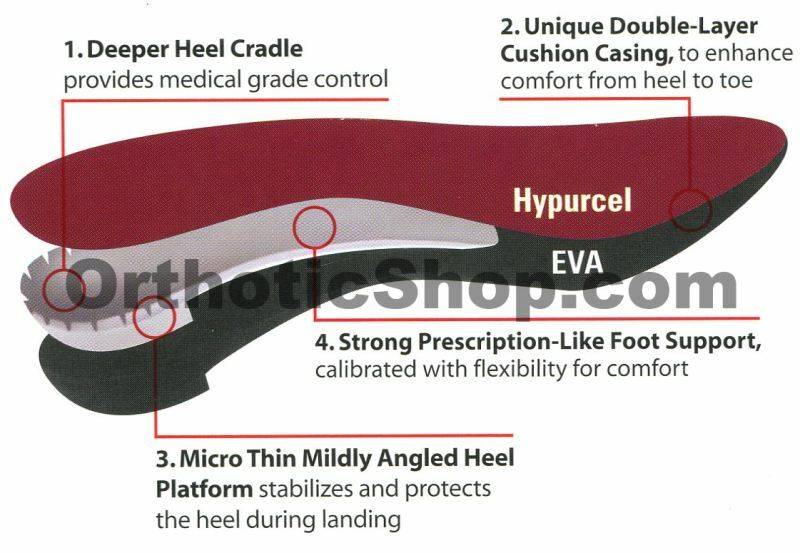 Deeper heel cradle provides medical grade pronation control. 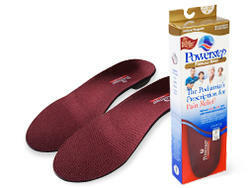 Alleviates pain associated with plantar fasciitis arch pain & heel spurs amongst other foot conditions. Supports & protects the arch, foot, ankle, knee, & lower back. Unique double-layer cushion casing to enhance comfort from heel to toe. Micro thin mildly angled heel platform stabilizes & protects the heel during landing. 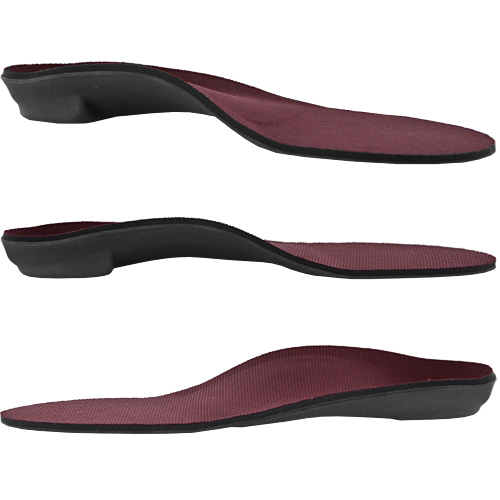 Strong prescription-like foot support that is calibrated with flexibility for added comfort. Double-layer cushioning made of Hypurcel and EVA enhances heel-to-toe comfort. Sanitiz fabric cover helps reduce slippage and heat build-up, so feet stay dry. 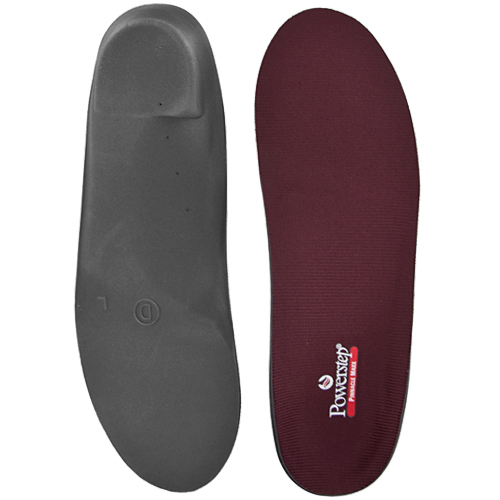 See the other Powerstep Orthotic Insoles & learn more about the podiatrist designed orthotics. View all Powerstep Orthotics items. Excellent - Comfortable I've had these for over 1 month. I bought them primarily for my golf shoes so I could walk 18 holes without pain. An Absolute success - no pain and they are extremely comfortable. I'll be buying more for my other shoes. Awesome Great orthotic for work and for sports. I use a pair in my work shoes, in my training shoes, and in my basketball shoes. Great support and protection for my plantar fasciitis. Best support Allows for true comfort inside my boots. Walking on air. Very helpful Although these only fit in one pair of my shoes, I have found relief from foot pain and will buy other shoes I can use them with...very helpful - a success!